Logan • Utah State placed the Old Wagon Wheel on the south plaza Saturday, giving fans an opportunity to pose for photos with the trophy and savor another victory over BYU. Those folks were allowed to live in the past, especially on homecoming weekend. The Aggie players were charged with moving ahead and pursuing a brand-new Mountain West trophy to go with their historic reward for beating the Cougars, and they’re succeeding so far. 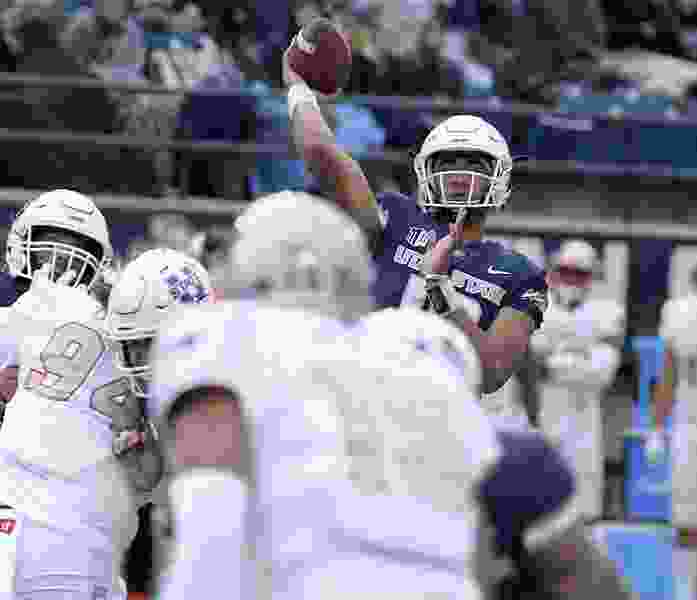 Utah State quarterback Jordan Love did pretty much a full day's work in the first half Saturday as the Aggies rolled to a 59-28 victory over UNLV in front of 21,212 fans at Maverik Stadium. Love finished with 322 yards passing and five touchdowns in less than three quarters, after posting 287 yards and four TDs by halftime as the Aggies took a 42-7 lead. USU coach Matt Wells was not about to revise history, knowing his team enjoyed winning in Provo. “I don't think we ever want to get away from celebrating wins,” he said. There's a lot of that going on in Logan this season. At the halfway point, the Aggies are 5-1 for the first time since 1978. Coincidentally enough, members of USU's championship teams from '78 (Pacific Coast Athletic Association), '93 (Big West) and 2013 (Mountain Division of the MW) were honored during homecoming, giving the current players incentive to become worthy of their own recognition in the future. They're trending that way. USU is 2-0 in conference play and, beginning with next weekend's trip to Wyoming, is favored in every game until the Nov. 24 regular-season finale at Boise State, according to ESPN's Football Power Index. Wells appreciated how his players responded to last weekend's success in Provo, reporting at 6:30 a.m. Monday “ready to roll,” he said. And once the Aggies got going Saturday, they produced their usual flurry of points in variable weather of rain, hail, clouds and sunshine. The worse it got in the first half, the better they played. USU trailed 7-0 after missing a short field goal on its first drive and going three plays and out on the second possession, starting at its 1-yard line after UNLV (2-4, 0-2) downed former Utah kicker Hayes Hicken’s punt. USU followed with five touchdowns in less than nine minutes, including Baron Gajkowski's 16-yard return of a punt that was blocked by Devin Thompkins. The offense scored touchdowns on five drives in a row.